As agricultural biodiversity deteriorates with increased reliance on fewer and fewer crop varieties, it is vital that policies to encourage the protection of crop genetic resources are considered and promoted. A new book by Juliana Santilli published by Earthscan, ‘Agrobiodiversity and the Law: Regulating Genetic Resources, Food Security and Cultural Diversity’, takes on this challenge. 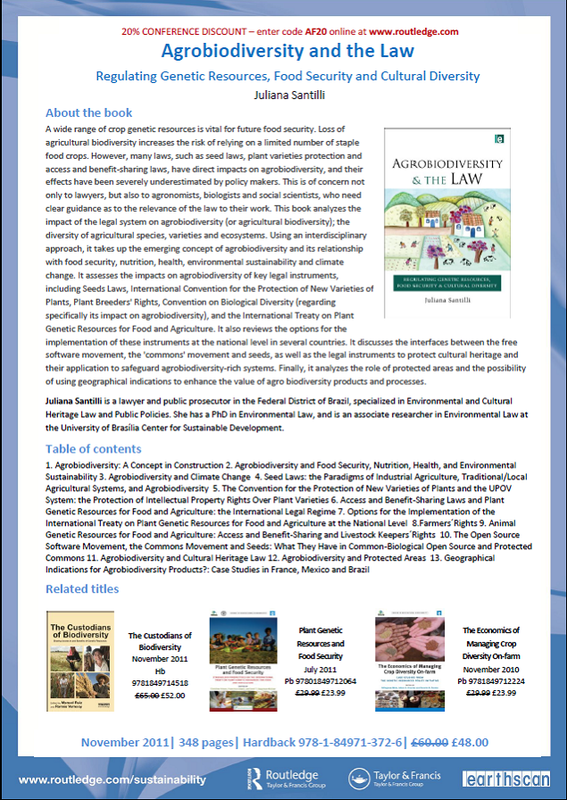 According to the online synopsis, "this book analyzes the impact of the legal system on agrobiodiversity (or agricultural biodiversity) – the diversity of agricultural species, varieties, and ecosystems. Using an interdisciplinary approach, it takes up the emerging concept of agrobiodiversity and its relationship with food security, nutrition, health, environmental sustainability, and climate change. 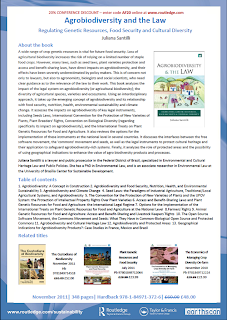 It assesses the impacts on agrobiodiversity of key legal instruments, including seeds laws, the International Convention for the Protection of New Varieties of Plants, plant breeders’ rights, the Convention on Biological Diversity (regarding specifically its impact on agrobiodiversity), and the International Treaty on Plant Genetic Resources for Food and Agriculture. It also reviews the options for the implementation of these instruments at the national level in several countries. It discusses the interfaces between the free software movement, the ‘commons’ movement, and seeds, as well as the legal instruments to protect cultural heritage and their application to safeguard agrobiodiversity-rich systems. Finally, it analyzes the role of protected areas and the possibility of using geographical indications to enhance the value of agrobiodiversity products and processes."